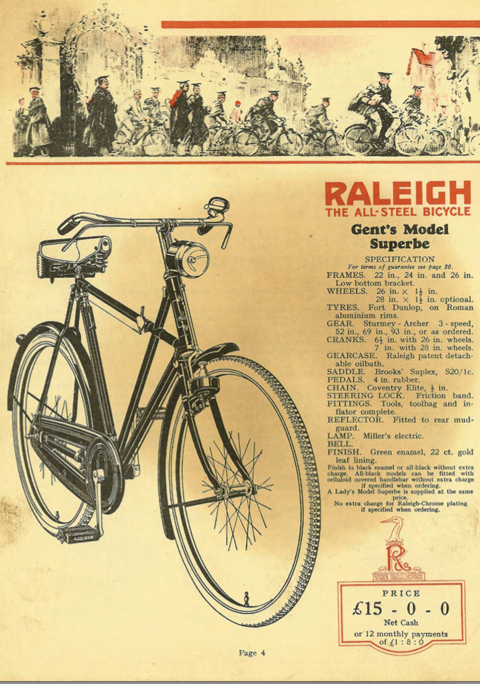 The most noticeable result of Raleigh’s price-cutting because of the Great Depression, was the absence of the Modele Superbe X Frame, which had previously received star-billing in all Raleigh catalogues. 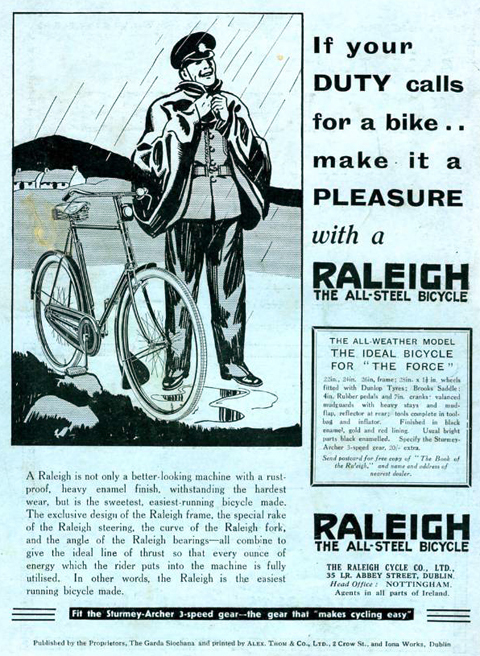 From now on, it was not heavily promoted, though it was advertised in some years’ catalogues as either the ‘Service Model’ or ‘Irish X Frame.’ There was still some demand for it, however, from overseas: Raleigh were able to reduce its production price by exporting it in parts for local assembly, so they continued to supply it for special order in this way until all the old parts were used up. I found this top condition 1934 Raleigh X Frame, in its original green enamel and 22 ct Gold Leaf lining, in Holland. It seems that even after Raleigh stopped advertising the X Frame in England, they continued to export them to Europe. Coincidentally, earlier this year I had purchased a similar bike, with frame number #U54464. This one is frame number #U54463 – it is extremely unusual to come across bicycles with consecutive frame numbers. This one is in much better condition than its ‘brother.’ It was kept as a display bike for many years. The paintwork is 100% original, with all its transfers (decals): on the headstock, rear mudguard, chaincase and also two on the down tube. One says ‘The All Steel’ and the other, at the top, reveals that this particular ‘Export Model’ was marketed as a ‘Tourist.’ The saddle has been replaced; the wheels and hubs and other chrome parts are excellent; it is in good mechanical condition and is ready to ride. While the Raleigh X Frame was sold in Holland as a top model, in Ireland it was downgraded to a cheap utility machine, painted black without pin-striping, and without gears. Here is the ‘brother’ Raleigh X Frame to #U54463. It’s extremely unusual to discover two machines that were alongside each other in the factory 81 years ago.